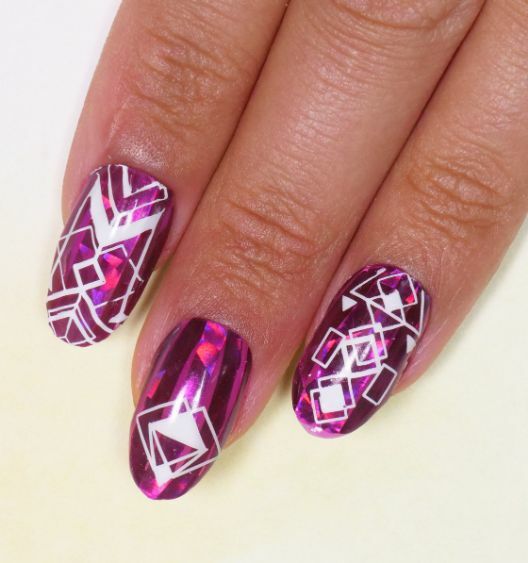 There’s no such thing as too much bling, especially when creating holographic nail art. Most nail designs that include transfer foil use it in small patches by pressing it against the nail. Here, you’ll cut the foil into thin strips to achieve a more complete effect. This fancy design also includes a purple base and a white geometric design. Using a nail stamper takes a little practice, but if you use stamping gel and clean the stamping plate after completing each individual nail, you’ll get good results. Since stamping gel dries quickly, this design works best on an accent nail. The finished design has a glossy finish and will have people wondering who did your nails. 1. To ensure your stamper is clean, press it against the sticky tape lint roller to remove any leftover paint. 2. 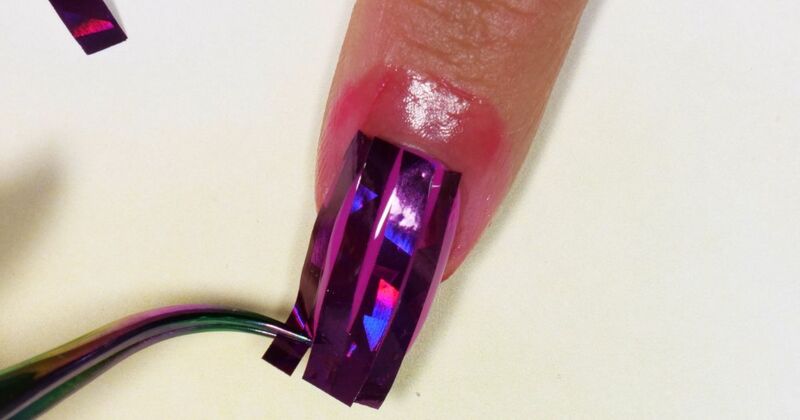 Apply one coat of purple gel polish to nails, then cure them with the UV or LED lamp. 3. Apply latex tape peel off cuticle guard to the skin around the nails and let it dry. 4. Apply a second coat of purple gel polish onto the nails, then cure with the lamp. 5. Cut a square of metallic transfer foil into thin strips. 6. Apply the soak-off base gel to the nails, then put foil strips on the nails and cure them. Tip: Use the tweezers to apply the foil, so you can position it perfectly. 7. Remove any strips that don’t adhere properly and trim the overhanging foil with the scissors to match your nail shape. 8. Apply no wipe matte gel top coat, then cure the nails with the lamp. 9. Apply white stamping gel paint to the stamping plate, then use the scraper to press the paint into the design. 10. Press the stamper onto the paint to transfer it, then stamp your nail and cure with the lamp. 11. Apply soak off sealer nail gel, then cure the nails once more. 12. Peel off cuticle guard with tweezers. 13. Clean the stamper by pressing it onto the sticky tape lint roller. 14. Clean the stamping plate and scraper with acetone and a soft cotton pad.